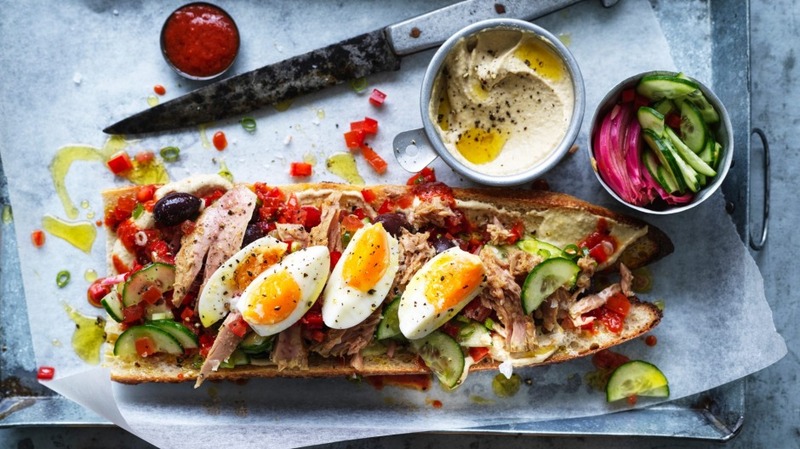 Tunisian casse-croute (a portable food snack) is bread stuffed with a crunchy, juicy salad of tomato, cucumber, capsicum and hard-boiled egg, spiced up with harissa. To make it office-friendly, pack the salad in a jar and assemble it when you're ready to eat. Other options include capers, boiled potato, parsley, coriander, anchovies, capers or pickled chillies. Or swap out the tuna for left-over pan-fried king salmon, roast chook or mozzarella. 1. Toss the red onion in vinegar and leave for 30 mins. To make the relish, mix harissa paste, tomato passata and olive oil until smooth. 2. To make the salad, whisk the olive oil, onions and vinegar, sea salt and pepper in a bowl. Add the tuna, tomato, cucumber, capsicum, olives and spring onions, tossing well. 3. Split the rolls and spread the base with hummus and the top with harissa relish. 4. When you're ready to eat, spoon the salad and hard-boiled egg onto the base, being generous with the juices. Add the top, press down firmly and leave for 10 minutes to soften before eating.